Box lacrosse is the most dynamic and physical format of our great game. Most of the coaching fundamentals from field lacrosse apply but there are a few key differences that I will highlight in this article. First make sure you understand the rules! See our rules summary at Box lacrosse for field players. This suggested coaching session is designed for a 2 hour slot. It can be condensed into 1.5 hours with fewer mini games at the end. Before you start any session have a look around the venue and check there is no damage to the boards or floor. This is first for player safety and second to avoid any risk of being liable for facility damage. You have obviously checked out any new venue before first use so you know the colour of the floor and boards. Many roller hockey venues in the UK have predominately white boards so using white balls will be an issue. If you are to play regularly indoors you will need a stash of orange balls. Depending on the existing floor lines you may need some tape to make temporary lines, especially a goalie crease area. The goalie crease has a radius of 9’3″ (2.8m) squared off 1 foot from the back of the goal frame. In smaller sized venues a crease this size would be proportionally too large so you may choose to make a little smaller, but no smaller than a 6′ radius otherwise the goalie will have no room to move. If existing crease markings exist for other sports, provided they are not too small, use them. Other box-specific floor markings can be optional assuming all venues will have a clear halfway line across the floor. As like any coaching session, never skip the warm-up. It’s all too easy for players to get on the floor and just start pounding the goalie with shots. Make sure you include arm, shoulder and chest exercises in your warm-up and don’t just focus on the legs. Note: Field players may not have bicep and kidney/back pads. If anyone does not have this protective equipment then implement a no cross checking rule. Remind players to keep their heads up during play, be aware of their position relative to the boards and never push an unsighted player into the boards, i.e. “boarding”. Static passing in pairs – Boring but essential to get eyes adjusted to being indoors and having boards directly in your eye line. You only need to do this for a couple of minutes. Now is the time the goalies can go away and get fully suited up. Rebounds off the boards – In groups of 4 or 5 players, the first player passes the ball against the boards and goes to the back of the line. The 2nd player collects the ball, typically after one bounce off the floor, and passes off the boards to the 3rd player, and so on. This gets players used to the bounce and spin off the boards and floor. You can add a variation where the 3rd player applies light pressure on the 2nd player as they collect the ball. The 2nd player has to make a pass to the 4th player, then repeat. Passing in pairs down the floor plus shot – Two players run down each side of the floor, approx 8-10m apart, passing between them until close to the goal, then one player shoots. The goalie is adjusting his position from pipe to pipe. After this drill is a good time to pause to explain the left/right theory of box lacrosse. In box lacrosse, there is an imaginary centre line drawn down the middle of the floor, from goal to goal. Right handed players generally keep to the left of this line, with left handed players to the right. Due to the smaller goal dimensions, the goalies padding and angles for shooting, it’s really difficult for a right handed shooter to score from the right side of the floor. Likewise lefty shooters on the opposite side. It’s for this reason most experienced teams will have a mix of predominantly right and left handed players. The 5 runners (outfield players) will typically consist of 3 right handed players and 2 left handed players, or visa versa. The side with 3 players is known as the strong side, with the weak side being the side with 2 players. 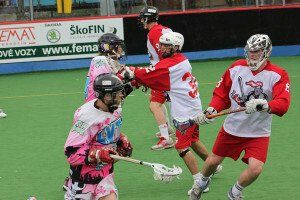 This still photo from an NLL game shows Colorado (in white) attacking on their weak side with 2 right handed players. The ball is with the player lowest in the picture. Colorado have 3 left handed players on their strong side. Here are three fairly simple drills that you would not see during a field lacrosse coaching session, as are unique to the nature of box lacrosse. It’s also worth doing them in this order for reasons I will explain. Players evenly spread in 5 lines across the width of the floor behind the goal. The 3 outside lines are the offence players. The 2 inside lines are the defence players. The ball starts with a defender who passes the ball to any attacker as the 3 attackers run out and set-up an attack. It’s then 3 v 2 looking for the quick shot, or one or two quick passes and a shot. This drill is rapid fire with the next line going as soon as the play is dead, i.e. a goal, missed shot, or lost possession. All players waiting to go next must keep their eye on the ball to avoid getting hit by a stray shot. This drill introduces some player-on-player contact but the offence should always get the upper hand due to being man-up. This drill is mainly about winning the ground ball battle, then ball retention under close defensive pressure. In a real game scenario a team mate will come help with a block/bump, creating some clear floor space to escape the pressure. This is the classic box lacrosse move, known as the “two man game”. It’s 2 v 2 using one half of the offensive zone, i.e. right handed attackers use the left half and left handed attackers use the right half. The biggest difference between box lacrosse and field lacrosse regarding offensive strategy is the two man game. In field lacrosse, if a team mate is under defensive pressure you normally get into space and shout for the pass, i.e. “help on your left!”. This does not work in the smaller box lacrosse arena. A ball carrier under defensive pressure will soon find himself heading towards the boards as there’s much less room to escape into. In box lacrosse a team mate must react quickly and come to help, and that help is to block/bump/impede the defender, allowing you to run into some clear air. This first element is the “pick”. As soon as the “pick” occurs and the defender is given a solid push away from your team mate, you need to “roll” towards the goal turning in the direction of your team mate. You will now be open for a dump pass, at least one stride clear of a defender. The “up-pick” is this movement with the ball carrier up high (away from the goal) and the pick being set by a team mate coming up from a low position somewhere near goal line extended. The “down pick” is the opposite. The ball carrier is low. The pick comes from a team mate starting in a high position. 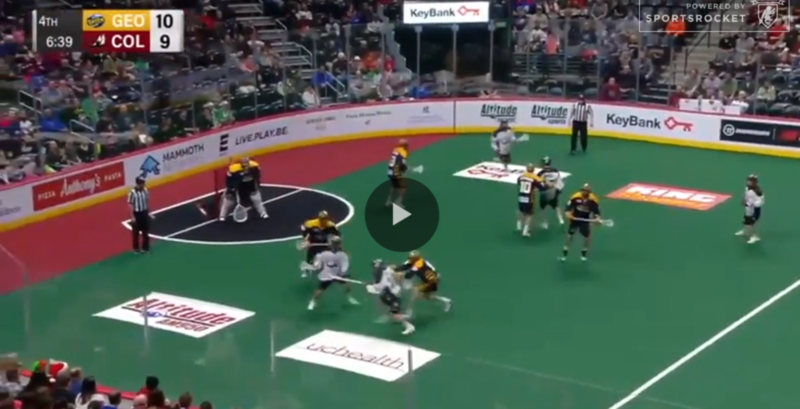 This video is an example of a “down pick” from the NLL. The two man game is all about timing. It’s like a dance routine. There is no problem is starting at walking pace, then increasing speed as the timing becomes second nature. When perfected there is little the two defenders can do about it other try an illegal hold (which experienced players will do… all the time). Organise two teams, ideally with an even split of right handed and left handed players, and offensive / defensive players. Ideally get them in matching jerseys or bibs, otherwise it’ll be chaos. For a group containing novice players, playing 10 minute periods will be sufficient and give breaks for water and coaching tips. For more experienced groups and when floor time allows, extend to 15 minute periods. Whilst box lacrosse is growing, fast, most venues in the UK won’t have shot clock systems installed. That’s not a problem, especially with notice groups as there is often a turnover way before 30 seconds elapses. The coach/referee can give a manual 10 second warning if at attacking play is dragging on a bit. Make sure you allow 5 minutes at the end of your session for a cool down. Get everyone doing at least two laps of the floor, then clear away the goals, collect up all the balls (remembering to check in bench areas) and get ready to collect up lots of damp sweaty kit. Now book your next box lacrosse coaching session.